In the last week, the NNEPC has seen a few cases of people eating a mushroom called the pigskin poison puffball (scleroderma citrinum). As you might guess from the name, this mushroom won’t agree with your stomach, and eating some could leave you throwing up for quite awhile. There are lots of these pigskin poison puffballs out right now. They are usually 1-4 inches wide and 1 or 2 inches tall and yellowish brown with rough warts on the outside. The spores inside are typically a deep black or purplish black, as in the picture here, but they can also be a lighter gray or brown. 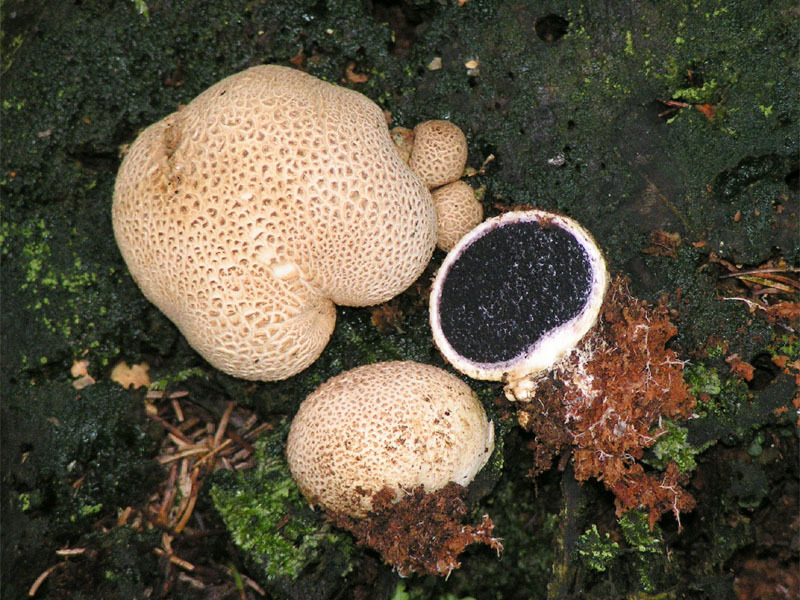 The pigskin poison puffball is sometimes taken for an edible puffball or mistaken with a truffle. To avoid mushroom poisonings, only eat wild mushrooms if they have been identified by a trained mushroom expert.